Internationally famous King of Cognac talks about the pleasures of "collecting, admiring and tasting"
The American author William Young once said, 'A bunch of grapes is beautiful, still and pure, but it is only the fruit only; after being squeezed, it becomes a kind of animal, as it later turned into wine, there is the animal's life.' Therefore, cognac - the essence extracted from the most outstanding white grapes of France - is termed 'L'eau de Vie', the Water of Life. This year is the 300th anniversary of Martell, one of the four most prestigious brands of Cognac. We have invited collector Mr Man's Chan, known as 'King of Cognac' by connoisseurs, to share with us in detail the beauty of cognac. 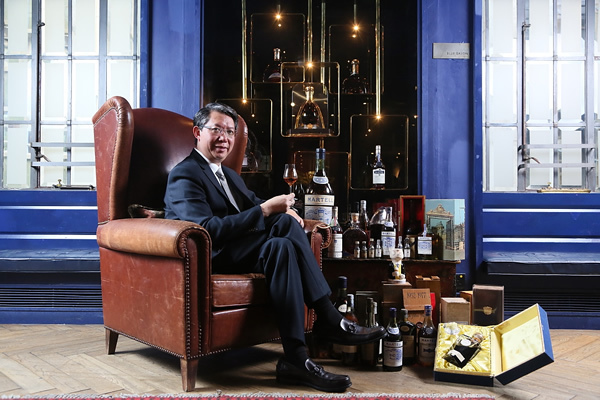 Mr. Chan is a qualified cognac educator (BNIC) with a gold medal. His first rule of thumb to enjoy cognac is to have it neat, as he says adding ice will lower the temperature of the cognac, and therefore making the aromas less fragrant. During the process of marrying, around 2% of the liquid gets evaporated and it is called "angel's share"
When it comes to Martell, it was also regarded as "the night club lady's drink" in the 80s - Martell Cordon Bleu, also known as "the blue ribbon"
Mr Chan's liquor collection consists of more than 14,000 bottles during peak periods. Now he has come to understand that quality matters more than quantity. 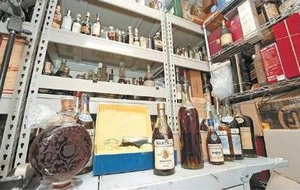 He now keeps around 5,000 bottles of fine selection.